SKU: GD-IM26-IRY3-1. 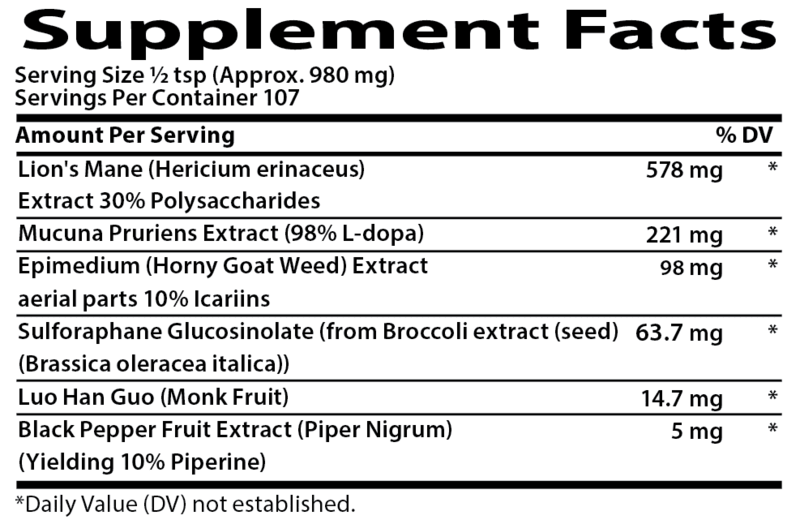 Categories: Brain Support, Energy Boost, Extracts, Immune Support, Longevity, Men's Health, Mood, Stress Relief, Women's Health. Tags: ADD, ADHD, Alzheimer’s, Alzheimer’s Disease, Anxiety, Anxiety Disorders, Autism, Brain Fog, Chronic Fatigue, cognition, Cognitive Decline, Cognitive Difficulties, concussions, Dementia, depression, Depression Disorders, Difficulty Concentrating, Epilepsy, FIBROMYALGIA, lions mane, memory, Memory Loss, MS, Multiple Sclerosis, Nerve Damage, nerve repair, Nerve support, Neuropathy, Parkinson’s, Parkinson’s Disease, Poor Memory, stroke, Stroke Risk. An unforgettable-looking mushroom that has garnered way too many animalistic titles to count, including deer’s tail, monkey head, and hedgehog mushroom. We include an herb that earned its captivating name by the kick of energy it would give livestock. In ancient times, this bean-like plant was remarkable for the way it made both people and animals itch when they came into contact with it. Arguably the healthiest benefits to eating kale, broccoli, and even kohlrabi are all due to some wondrous phytochemicals found in all these members of the Brassica family. Nerve Support & Repair No Matter How You Mix It! I have been taking this in my decaf coffee every morning for the last couple of weeks. It blends pretty well – makes the coffee a bit more bitter, but not bad. I do seem to be more alert during the day – moderate improvement in general ‘wit.’ I will finish off the box and order at least one more time to confirm if the supplement truly works as promised. (If I didn’t notice anything, I wouldn’t give it a 2 box trial). I am using this to help with Neuropathy. I take it in the evening before bedtime to help with sleep. I have only been using the product a short time but it appears to be helping. I will leave another review in a few weeks. How does our Neuro-Regen formula accomplish all the amazing feats above? The natural world has a lot to offer in nerve and nervous system support—but we’ve decided to only choose among the very best botanicals to include in our blend. Centuries (if not millennia) ago, ancestors of ours from all over the world discovered and tested the uses of many different herbs and fungi for their healing properties. Expert herbalists and healers of all kinds mastered their uses. Looking at what they have discovered and accomplished, we’ve learned a lot about what specific plant-based ingredients, herbs, and mushrooms can do for the brain, nerves, neurons, and overall nervous system health. Today, research and traditional use have together hand-in-hand narrowed the best botanical uses down to a select few species, each with impressive reputations both in their body and field of traditional use—and scientific studies to boot. None of our ingredients roar quite so loudly in the world of nerve recovery as the lordly lion’s mane. Along with other widely popular medicinal mushrooms like reishi and cordyceps, lion’s mane has been a go-to remedy in the practice of Traditional Chinese Medicine (TCM). Originally, lion’s mane was a simple tonic that visibly improved overall health—though healers noticed it had an especially strong impact on the brain, nerves, mood, and much more. Hearing the name of this herb is sure to intrigue. Scientifically known as epimedium, its more common names reveal more than enough about its benefits in the realm of energy, vitality, and the reproductive system. But Epimedium has another trick up its sleeve: it helps heal and protect nerves, much like lion’s mane does. Many of us may not recognize this herb in the Western world. It looks somewhat like a vanilla bean, though it’s unrelated to the culinary spice. In Eastern and Asian healing practices, however, the reputation of the herb mucuna pruriens is only preceded by very few others. What was once appreciated as a faultless nerve tonic now has science and research to back those claims and uses today. Beyond the astounding nerve tonic potential hidden in a small handful of healing herbs, apparently, there is impressive healing potential to be found in our everyday plant foods as well. Sulforaphane, compounds found in vegetables of the brassica family, are a great example of this. These sulfur-like phytochemicals can be experienced when eating and enjoying veggies such as broccoli, kale, cauliflower, cabbage, radishes, turnips, mustard, kohlrabi, and many others besides. What’s more, they have purported anti-inflammatory and antioxidant benefits. Why focus on the nerves and the nervous system? Why are they so important, and how (and why) do they play such an important role in health and wellness? More importantly: what are nerves? Making up the bulk and the majority of our nervous systems, nerves are basically bundles of cable-like tissues that branch out through practically every surface and organ of our bodies. We need nerves to feel and sense pain, as well as many other sensations. Nerves also transport certain messages between far-flung and distant areas of the body that need to communicate with one another. Without them, the entire body would be disassociated, disconnected, and out-of-sync. Without sensation perception of pain, for example, the body would become damaged without any knowledge of when (or how) to protect itself and heal itself. In short, nerves and the nervous system are the pathways between which we communicate with our own bodies. Nerves let us know if we are experiencing too much pain or damage, or too much stress, depression, and anxiety. As a less obvious or known benefit, they are also great gauges for how much energy we have. This is all the more reason to focus on and take care of the nervous system—including with the help of botanicals and other natural means. WHY WOULD I NEED EXTRA NERVE SUPPORT? When mixed all together, these favorite formula herbs for nerve support cover all the bases one could possibly imagine when working to strengthen the nervous system. At their basic foundation, each herb, mushroom, or plant-based ingredient supports the nerves and neurons, old and new. Branching out from these benefits, however, there’s far more to Neuro Regen’s ingredients than meets the eye. Why pursue better healthiness and support for the nervous system with the use of botanicals? Some of the following reasons may convince. It’s one of the elemental basics of the nervous system: nerves tie into mood. The majority of us know that. But this also has huge implications for dealing with mood states like stress, depression, and even anxiety. And not just as simple mood states, but for the benefit of more major conditions as well. Plenty of studies suggest that herbs that help regenerate the nerves and neurons can also have an enormous impact on moods and mood disorders, with herbs and fungi like lion’s mane and mucuna pruriens being great examples. It may surprise some to hear that the well-being of the nervous system and nerves also has a strong connection to energy levels. The central nervous system, for example—referring to the brain and spinal cord—is responsible for the creation and circulation of many neurotransmitters. Serotonin, dopamine, and many others among these neurotransmitters govern the body’s energy levels in a variety of shocking ways. When the nerves and nervous system suffer or get out of whack, there’s a sure bet that energy levels will be impacted or involved. Investigating the help and support of various botanicals and plant-based ingredients to improve nerve health and the nervous system can have some interesting (and energizing) benefits, too. 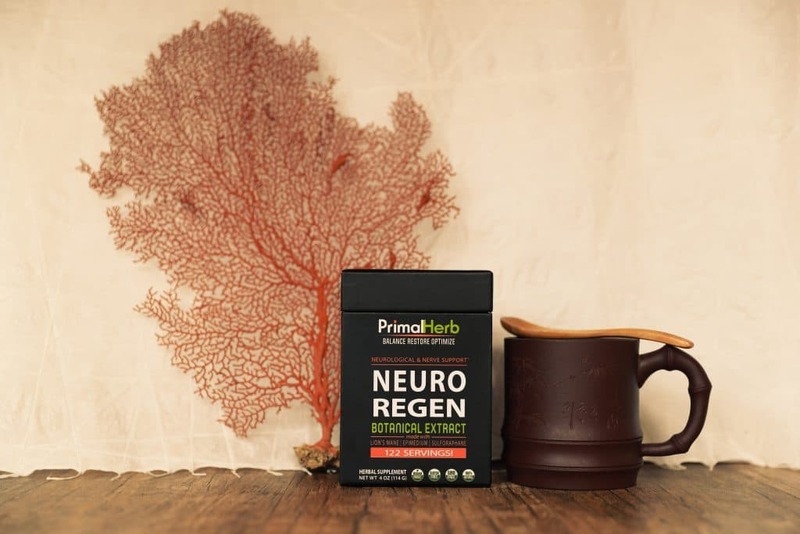 Numbering among the most likely reasons someone may take interest in neuro-regenerative herbs is to experience cognition, focus, and memory-boosting effects—also known as nootropic effects. 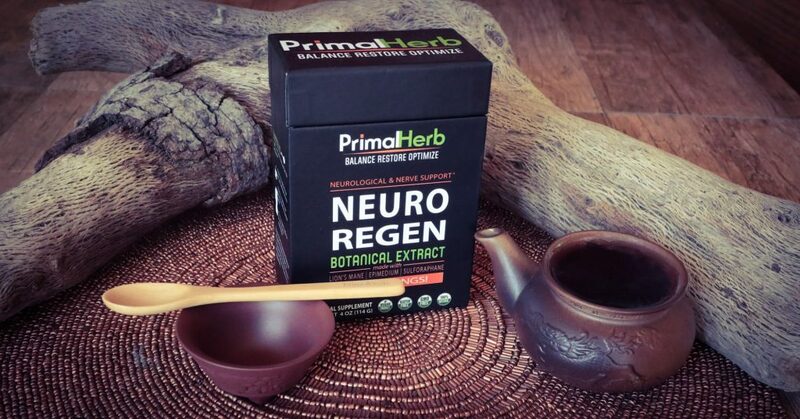 One of the most immediate effects of trying neuro-boosting herbs is overall better brain function. Strengthening the nerves and nervous system helps with all this, whether the brain is stressed or if one is experiencing a dip in cognitive function as a telltale sign of aging. Healers of the past have caught onto this benefit, and even today, athletes and health experts can vouch for this link, too—which can be strengthened with the help of neuro-regenerative herbs. It might be the biggest benefit of nerve-supporting herbs of all. In addition to reducing risk, it can also form support for people already experiencing these imbalances. Far beyond looking to these ingredients for specific nerve support, there are a few not-so-obvious—and in fact subtle—signs that one’s nervous system could need a little boost. In such instances, some of the ingredients in this powerful formula might just come in handy. Even if there’s no condition involved or of concern, the herbs, mushrooms, and plant-based phytochemicals can still be turned to for a little health boost. This applies even if a person doesn’t have a diagnosed disorder, but is experiencing nerve-related challenges nonetheless. 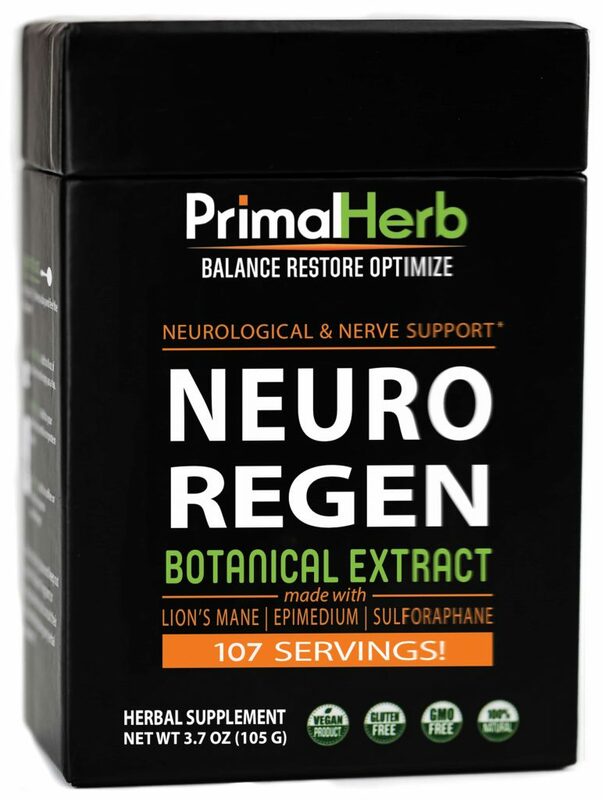 Neuro Regen can be taken day or night – with or without food, so enjoy! Real game changer. At the age of 36 I’m well versed in various types of nootropics and adaptogenic herbs. Over the past 10+ years I’ve sought effective tonics for longevity, mental acuity and optimal overall performance both in and out of the gym. Having used both lion’s mane and epimedium separately in the past, I’m happy to report that the synergy is quite amazing. Cheers! ok folks, I hardly leave any reviews about anything (less than 10 including this one), but I decided to do based on several devestating injuries along with medical complications since 2009. So I have invested much time and money (between illnusses & injuries) to recover, get well, blah blah, several things eirked and are wirking, the rest did not. I purchased first Neuro Shroom and started taking it per recommended dosage & noticed some slight changes very positive changes. several weeks after i had purchased this, I decided to purchase and add the Neuro Regen to my regimen. Now I have noticed a positive healing physical-mental-spiritual. Thank you for TRUSTWORTHY quality products, people (besides me) can depend on. I don’t have enough time to keep trying things over & over or wonder what is really in what I am taking for my progressive recovery. Thank you Primal Herb, your employees & all your source material for helping me and the planet. My review is unsolicated and I am not seeking compensation.